1. 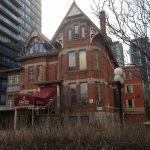 The Selby Hotel was the most recent use of this building at Sherbourne and Selby Sts, in Toronto. 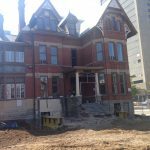 Built by the Gooderham Family in the late 19th century, it was the home of Charles Horace Gooderham – son of William Gooderham. 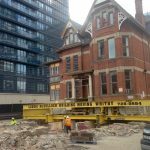 Perhaps best known through the 20th century as the Selby Hotel, this grand old mansion in downtown Toronto took a little trip in 2015! 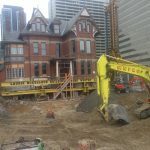 As part of a dramatic transformation of the Sherbourne/Bloor area of Toronto, this house, was moved eastward about 100 feet from the place it was built, in order to create enough space for a new 50+ storey apartment tower being inserted behind it. 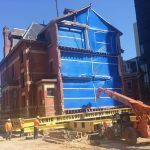 It is no easy task to take a brick and stone building that was built in 1884, lift it up and set it down again with all its bits still intact. But engineers can do some amazing things! 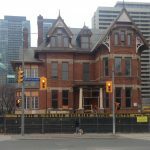 This house was originally occupied by Charles Horace Gooderham, son of William Gooderham, of the Gooderham & Worts Distillery fame. 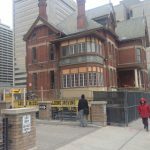 Over the years, this residence played numerous important roles, including providing a home for Branksome Hall, a private school for girls, as well as the Selby Hotel, which functioned both as a hotel and as a long-term residence for some of Toronto’s most colourful citizens – including Ernest Hemingway! 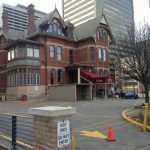 One of my great grandmothers, Mary Worts, lived at the Selby for some years in the early-mid 20th century. 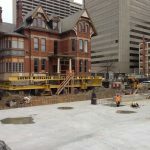 rolling the building, with the help of two giant tow trucks – first rolling westward, so a new foundation pad could be constructed beside Sherbourne St, then rolling back eastward until was positioned on the new foundation pad. The system of criss-crossed girders was key to the mechanism that enabled the workers to roll the house. 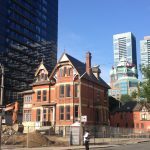 Two side notes: 1) the James Cooper House, immediately south of the Gooderham house, went through the same process a few years ago and seems to have survived the process quite well – and the building has been preserved. 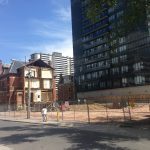 2) the massive intensification that is associated with the building of these sorts of 40 to 50 storey towers along subway lines is indeed increasing populations in the downtown core – even though the City has not yet improved the transit systems. I do hope that the desired dynamic balance does in fact reach some kind of functional equilibrium. 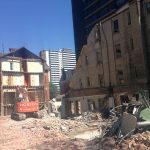 2 The Selby Hotel closes and demolition is set to begin. 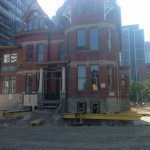 3 The core of the hotel was the old Gooderham house. Additions expanded its capacity – the back addition is visible here. 4. Wide-angle view of the Selby Hotel, including back addition. 5 Showing where this building was to be moved to. 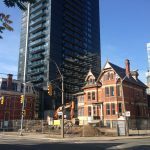 The James Cooper House, in the distance, was moved forward in a similar way a few years ago, to make way for the Tridel condo tower now behind it. 6 The old Selby Hotel additions, located in the rear of the building, being demolished. 7 This house once had a big back yard! 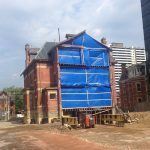 8 The Gooderham house takes on a more human scale now that the additions have been stripped away. 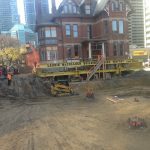 9 View from Across Sherbourne Street, looking South/West. 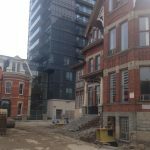 10 Looking South/West from Sherbourne and Howard St – both the James Cooper House (which was also subjected to the process of being moved forward to make way for a large tower being built behind) and the Charles Horace Gooderham houses are in view. 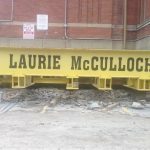 11 The two main girders that will support the house during the move are about to be placed under the structure. 12 Two large steel girders are placed under the house, in preparation for the move. 13 Two main support girders, in place. 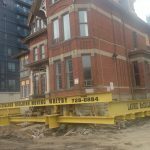 14 Girders and supports piercing the foundation of the house. 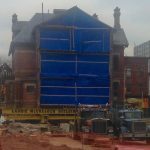 15 It still isn’t clear how this this house is going to be rolled along, but the evolving system of support is impressive! 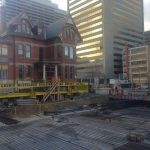 16 That is a lot of girders – but necessary to support the building in many places as the structure is jacked up and rolled. 17 The girder system becomes ever more intricate. 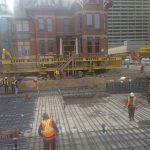 18 All the girders are bolted to one another, creating a very strong support system for moving the building. 19. 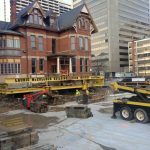 The girder structure needed to support the house during the move is fascinating! I have added a few more pictures today. The girder structure that will support the building during its move has become much more elaborate! But it isn’t ready yet. 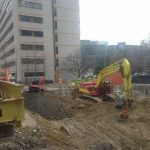 As yet, the building still seems to be connected to the foundation. I don’t know how they will physically disconnect it. Will it involve a big, horizontal saw? 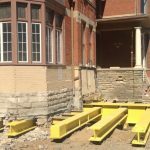 I also don’t see any apparatus for the girder system to roll on when they finally are ready to roll the building backwards. These are some of the interesting questions that may be revealed in the coming days or weeks. Stay tuned! 20 Interlocking Girders – The piercing of the building seems very extensive and violent – but essential for the goal. Each girder has to be shimmed to make sure that the building is solidly supported. All the girders must be bolted together so they act as one support structure. 21 Interlocking Girders – At some point, I imagine that they will need to need to cut the foundation laterally so that building can be moved backwards. Will they do that from the inside? With a large saw blade? No idea! 22 Interlocking Girders – The ends of these girders, I am guessing, will need to be tied together somehow, to provide as much even support as possible. 23 Wrapping the Building in Steel and ads. They must be getting close to the dramatic move. 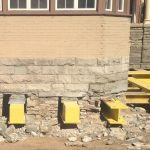 But the building is still connected to the foundation. 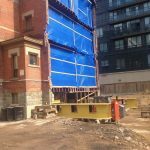 And I don’t see a mechanism for the building to roll backwards into the space they have prepared for it. So I am guessing we are still days away from actual movement. 24 Wrapping the building in steel and ads – front. 25 Completing the bracing support – On October 5th, the crew had completed the support structure that would hold the building together for the move. 26 Removing the old foundation – Although the building had been jacked up about an inch or two a couple of weeks ago – effecively separating the building from its foundation, it was only in the past week that the crew actually removed the old foundation wall so that there would be no obstructions as the building was being moved backwards the required 40 feet. 27 Building completely severed. 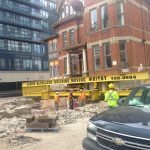 It was clear that the building was set to be moved the next day, October 7th. 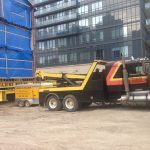 28 Twin tow trucks – ready for the move. 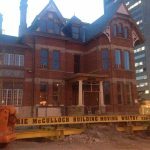 On Tuesday night, October 6th, 2015, two massive tow trucks were in place behind the building. 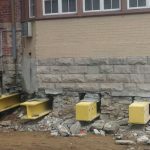 They were tied to anchor points in front, with long chains reaching inside the building to the steel girder structure that now holds up the building. The house has now been moved – at least a little bit. 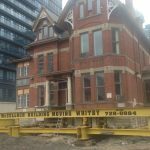 One might say that 40 feet is not a great journey, but for a large Victorian house, it is no triffling matter! 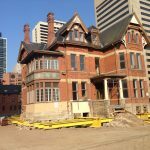 The move of the house has captured the interest of many people in the neighbourhood, both for its technical complexity and for what it says about how the city is valuing (at least some) of its built heritage. 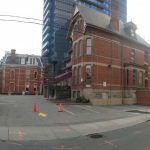 On the street, many stories are being told about how people are connected to the house, and the Selby Hotel, and what folks know about it. I have found it pretty fascinating, on many levels. 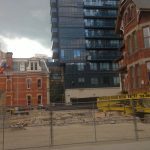 That all of this is being done to make way for a 50 storey building of high-end rentals is a discussion for another day. For now, this first phase of the building move is complete. 29 By 4:00 pm on October 7th, the building had been moved back 40 feet! No damage! 30 The old basement is now exposed where the building used to stand. I asked if anything of interest had been turned up in the soil. One of the workers said that the most interesting things would likely turn up later on. For now, the most interesting thing is an old safe that dates back to the early days of the house. No idea what, if anything, is in it. 32 The old basement exposed – seen from the south east. 33 Building moved back – seen from north east side. 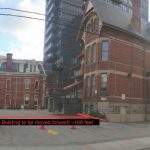 The builders will now spend a month or more preparing the front area for the parking garage that will be built, as well as the pad that will support the house. 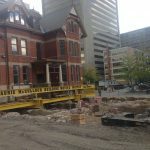 After that is done, the house will then be moved forward and set down on its new resting place for the next century or two. 34 Tow trucks – Two of these monster power houses provided the muscle that pulled the house during its 40 foot westward journey. 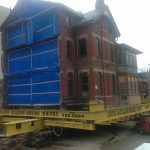 Today, the Charles Horace Gooderham house, also known as the old Selby Hotel, was finally moved to its approximate final location close to the sidewalk on Sherbourne St, at Selby Street! 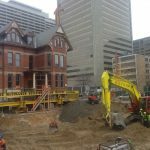 It has been an impressive piece of engineering to raise the building while keeping it intact, then moving it backwards far enough so that other construction folks could build a proper foundation for the building to be set upon in its new location. 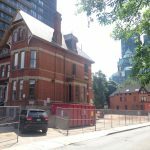 The overall effect will be to preserve an historical structure while making way for a high-density apartment building, to be built behind the old Gooderham house. I have uploaded another group of photos that give some idea of the process that has been undertaken over the recent weeks. There is still more to come as the building is actually settled back down onto the ground, as opposed to being supported on large steel girders. But the most dramatic work has now been accomplished. It has attracted much attention over the past few months – and for good reason! 42 Concrete Pad now complete! 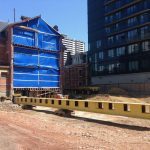 45 House is moved forward slowly on rollers positioned under two massive beams under the building. 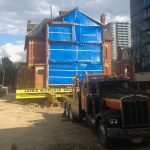 46 Final part of the move required repositioning the tow trucks at rear of house and threading cables under the building and through pullies anchored to piers at Sherbourne St and pulling from behind. 47 House now fully positioned on the concrete pad near where it will be positioned. 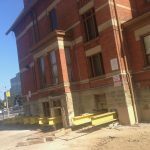 48 Final part of the move required repositioning the tow trucks at rear of house and threading cables under the building and through pullies anchored to piers at Sherbourne St and pulling from behind. 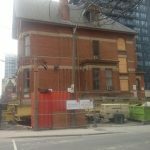 49 Building has now been positioned very close to the sidewalk on Sherbourne St.
50 Final resting place, for the old Gooderham mansion, at least for now.